"Michael, I just saw the cover photo of you on the Riverhead Newspaper from your site. Great photo. It’s so nice to see news coverage of our sport with out the superlatives; extreme, or rescue." I'm with you, Frank, particularly re windsurfing photos captioned "rescue". Even more particularly, photos of ME windsurfing, captioned "rescue." But that would be better than a photo of me windsurfing, captioned "his remains were found..."
Which I suppose would still beat a photo of me windsurfing, captioned "he was last seen being dragged below the surface by huge sharks." awesome photo...I miss the bay....and you numero uno puffin! Much much MUCH better than THIS. Not good. Not good at all. Lady, leave us frostbite-frolickin' fools to make our own choices. Good thing is most of the comments are saying the same thing (you'll like Greg Despin's, I think he was #21. I'm #28, right before the anonymous jerk (whose comment will hopefully be pulled as inappropriate & dumb before too long). re the photo, once again I thank photographer Barbaraellen Koch, for both the great photo and the non-sensationalist caption. Re the lawsuit...I've got to think some ambulance chaser is responsible for trying to make this a public safey issue. It's ridiculous. Hey GeniusofDespair...my response to you didn't stick to the blog! We are thrilled to have an original Peconic Puffin posting comments! The bay misses you (and Bob) too! 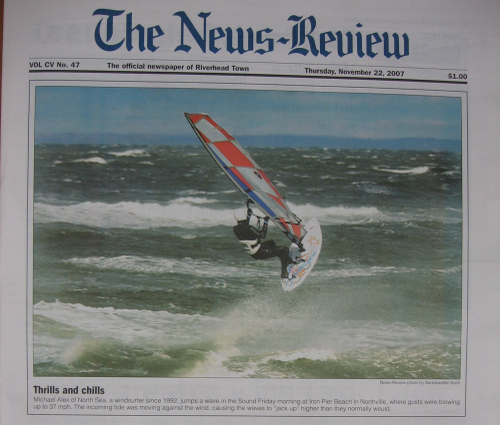 This is actually the 3rd time in the past 5 or so years that the Riverhead News-Review has displayed a windsurfer on the front page. The two previous issues featured guys in their 50's & 60's, and at least one, that I can remember, was at the Iron Pier Beach. Just browsing, top quality shot. Colour coordinated superfreak and board is a great idea. IMHO, jibing is more than just turning around.